Atlanta Granite For Less is your one stop top countertop shop! Say that five times fast, I dare you! We oversee your whole project, from assisting to your design ideas, securing the best pricing within your budget, to templating your project, fabricating and installing all natural stone or engineered slab countertops. This includes granite, marble, travertine, quartz (i.e. LG Viatera, Silestone, Caesarstone), soapstone, and limestone. Whether you are a contractor with condos or grandma with a guest vanity, we’re here for you! We do both residential and commercial projects, no matter how big or small. Our work is direct to you the consumer; therefore, we are well experienced and trained to deal with all of the unforeseen issues that arise in existing homes and commercial projects. No, we’re not just into “selling countertops”! We are here to assist you from start to finish on any project. From design challenges to budget requirements to the actual supervision of the fabrication and installation so that you don’t have to stress out about something that should be a pleasurable experience! We love what we do and we do it well. We bring our expertise to you. Yes, some companies want you to fax or email them the drawing of your kitchen. The only problem with that is they never get to see all the unique details of your job. And frankly, picking a granite color in a showroom or at a slab yard before you see samples in your home can often leads to poor color choices. It’s your house’s design scheme that dictates how the granite will look, not the showroom’s! Our sales department are all trained to help you find the right set of selections from color to backsplash tile and edge choice. Our materials are all from local warehouses. Therefore, the samples we have are from actual current inventory. We highly recommend making “full 360” informative decisions so we want you to come visit our warehouse and choose the actual slabs in person. We eliminate the massive amount of time and confusion that some customers seem to go through working with other granite companies in their slab yards. 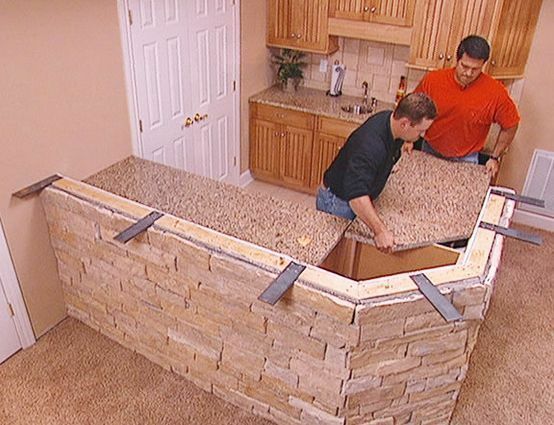 Some companies choose not to disconnect existing plumbing or offer tear out and disposal services of existing countertops. We do it all! Our installers can tear out and dispose of any type of existing countertops you may need removed. We will also disconnect the plumbing before we start work the same day we come to install your countertops. So you don’t have to call around to find a handyman to do so and be without your kitchen any longer than necessary. We also partner with licensed plumbers who can be scheduled to come in the same day after the installation of your project has been done. If you choose to go with a tile backsplash, we have partner tile professionals who can immediately start as soon as your countertops have been installed. Our partner tile crews are affordable, quick, precise, respectful, and clean. So if you need a tile contractor, we can help you there as well. We do the stressful part for you. We know that many times it’s hard it is to find good pricing and service from tile contractors so please don’t hesitate to ask us about these partner services. Yes, we have a miracle worker repair and restore man! If you have present natural or engineered stone issues, we have the guy that can help! He is probably the best in the industry. Let us stress the rarity of being able to offer a true “fixer” restore/and repair man that can most likely be the solution to your countertop or stone problem. Atlanta Granite For Less partners with only the best in the industry.